Every year thousands of artists and spectators lug all of their creations to the south-eastern tip of the United States to create America’s largest art fair- Art Basel Miami. 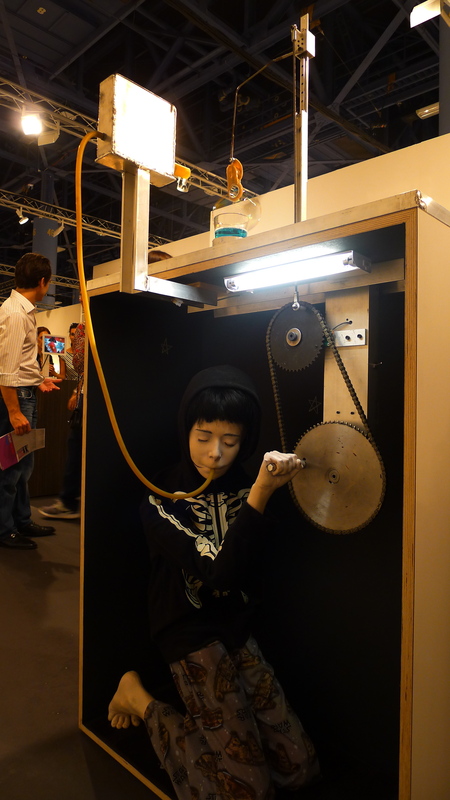 While the main event is held in the convention center in Miami Beach- many fairs, installations, and openings pop-up all over town. Looking at so much art in one place- one must be careful not to get “baseled” out! 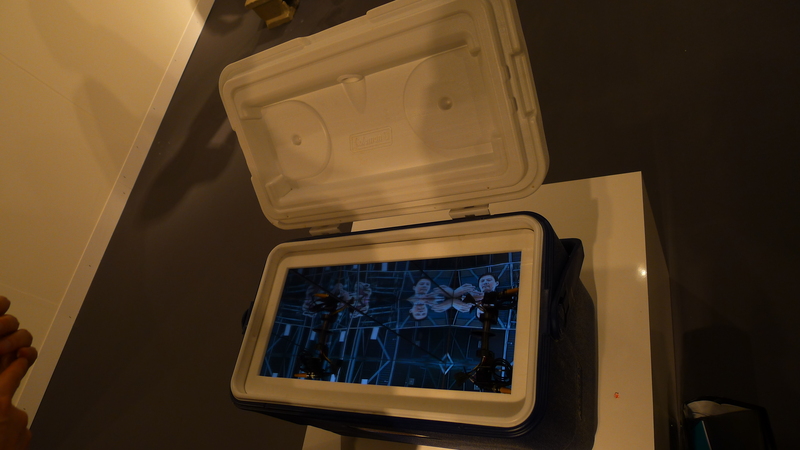 So I went forth looking at the overall shows of Art Basel Miami from a participatory art stand point on behalf of Figment Project NYC (http://figmentproject.com/). I wanted to do more than “see” art- I wanted to experience it. Although many places are armed with guards and “Please Do Not Touch” signs aplenty- there were several installations around town that really stood out and invited their audience to have a more intimate encounter. Fountain Art Fair (http://www.fountainartfair.com/) was the first place that I saw art that was out rightly labeled “Touch me”! “Squeeze me!” These signs were on rock star hand puppets created by Hayley Mc Cullough. 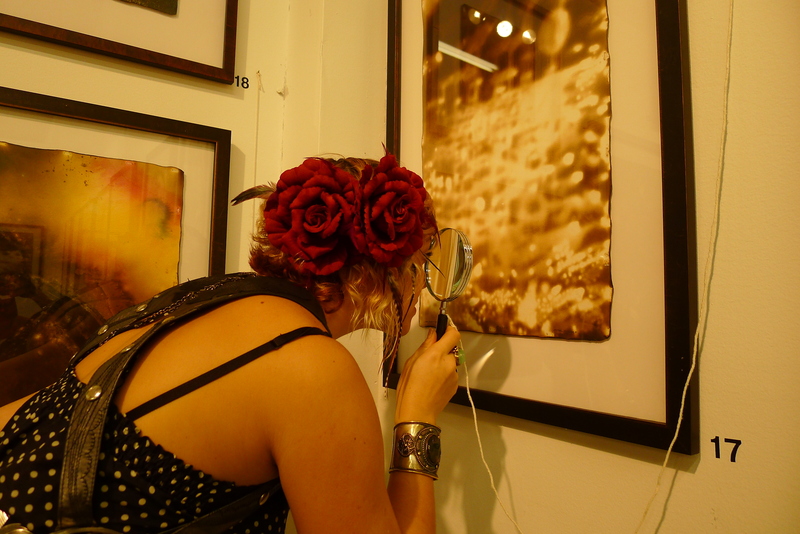 Her pieces were the first to break the barrier from just looking at art- to interacting with it. Around the corner at “Pete’s Fingers” magnifying glasses provided next to each piece allowed the audience to further explore the detail of his work. Maxine Nienow takes a closer look. 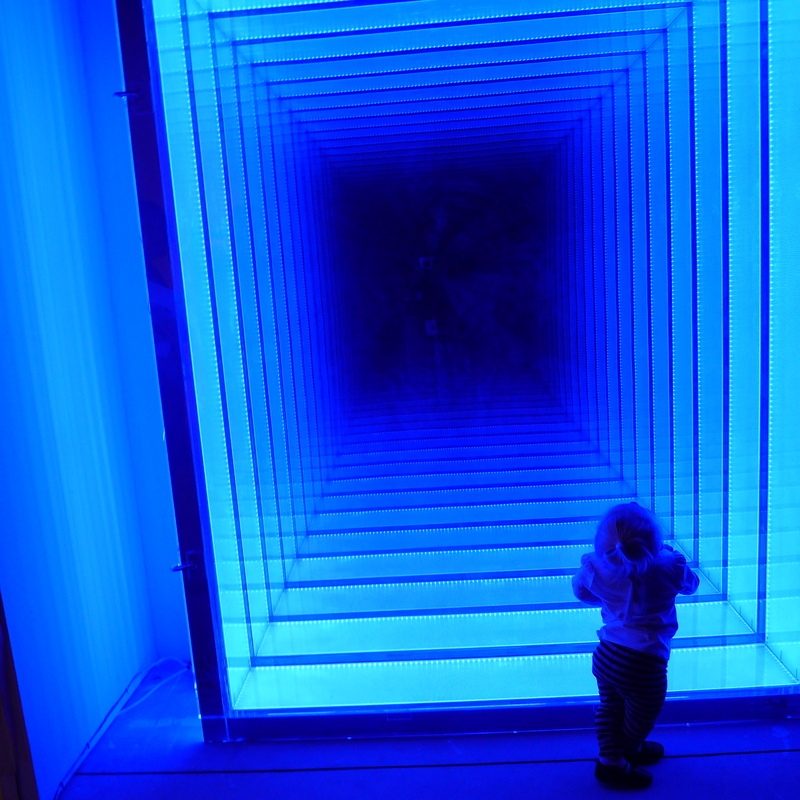 Art Miami, which paired up this year with CONTEXT art fair featured Chul Hyun Ahn’s intoxicating array of smoke and mirrors as these art pieces extended their lights into an infinite universe where all were welcome to explore. 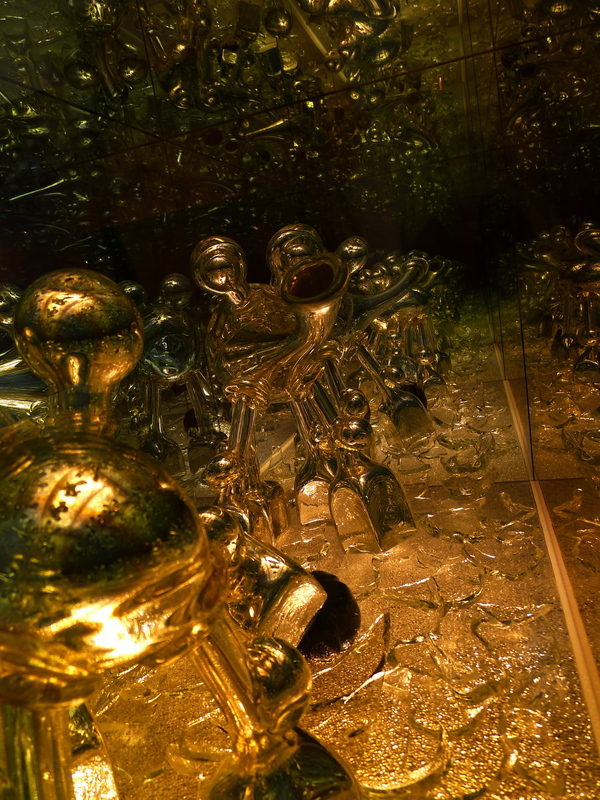 Also at Art Miami, Andrew Erdos- A Brooklyn based artist, made 3D glass mirror boxessurrounding his blown glass pieces that allowed you to engage with the art in a different way- without touching it- but pending on where you stood you could see a whole new world from each direction from all four sides.His technique also eliminated the viewers reflection from the infinity universe created within his art. 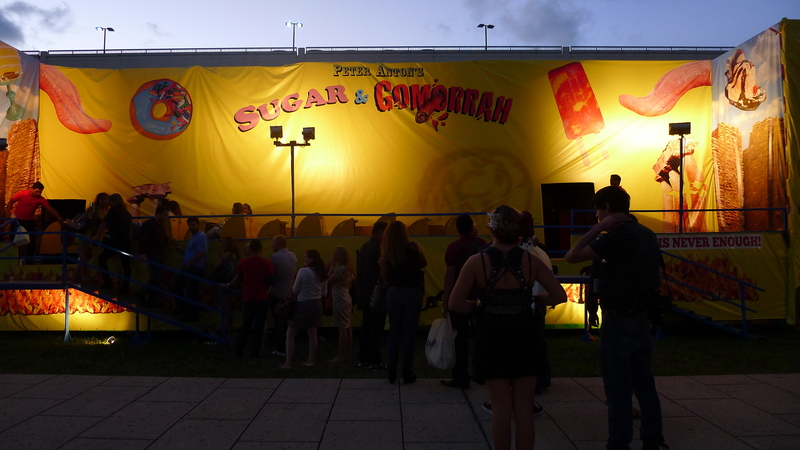 Across the street from Art Miami there was a participatory art piece that was a full on roller coaster through Peter Anton’s art installation “Sugar & Gomorrah!” Everyone patiently stood in line and watched guests emerge from the other side with HUGE smiles on their faces- I guess it was worth the wait! Once in my lil yellow car I went through a series of small hills and drops while couples on display made out and flashed me! Giant lollypops and sugary treats were installed in all directions. 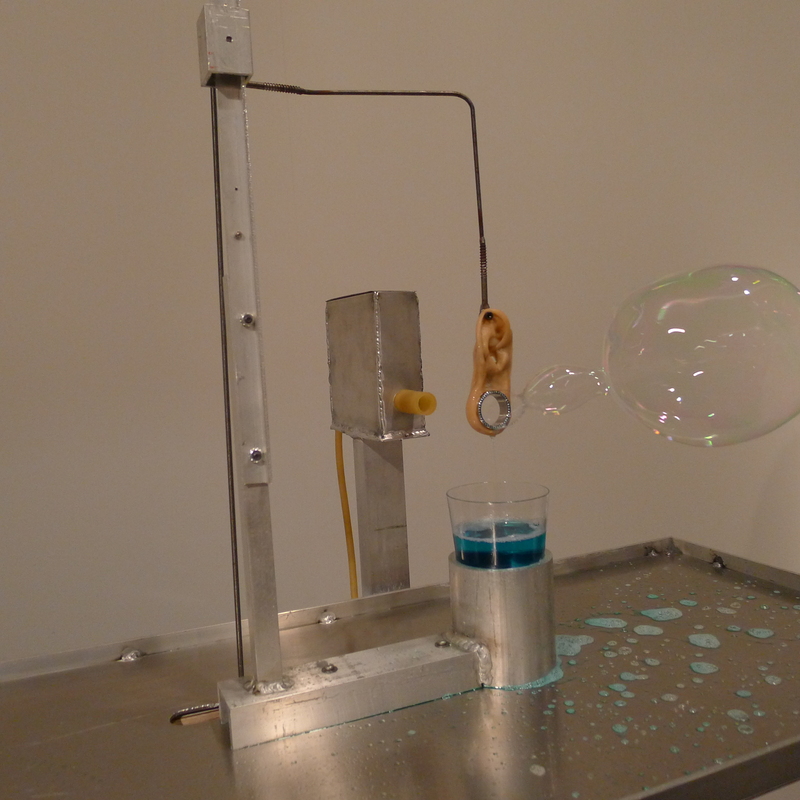 Gina Kamentsky of William Baczek Fine Arts showed a few interactive pieces at the Aqua Art Fair that were mechanically interactive. By turning a knob or a lever- a series of events and musical tones, knocks, whistles and movements would occur across the piece. Most of these pieces were comprised of found objects. I loved their simplicity in design and style! Here is Najva Sol putting one into action! One of my favorite interactive pieces was at Art Public in Collins Park in front of the Bass Museum with its huge geodesic swinging pendulum! Unfortunately, I missed the artists name and am having a hard time finding it- but see it in action below! At the actual convention center- the only piece that really caught my eye- as well as the rest of me- was the split screen surveilance camera pieces. There were super clever mechanics at play, creativity, and perhaps a bit of teen angst seeping through these pieces. The artist (whose name is to be added later along with video links to their work) has a fascination with the concept that Big Brother is watching. In some of the pieces- animatronic children are hiding under tables and making the cameras move- along with other objects- creating that moment where you realize things aren’t really as they seem. 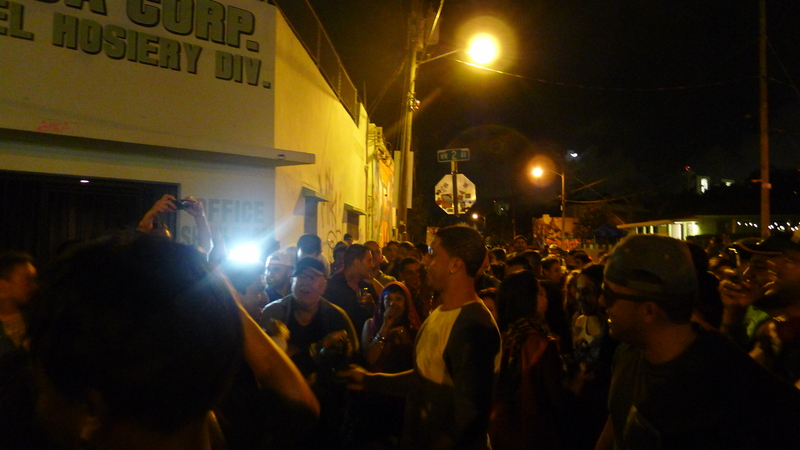 While in the fine art world interactive art was present but far and few between- I feel that that real interactive spirit of Art Basel Miami was found within their graffiti and muralist scene. Juan Salgado, Street Artist from Puerto Rico sets up shop. 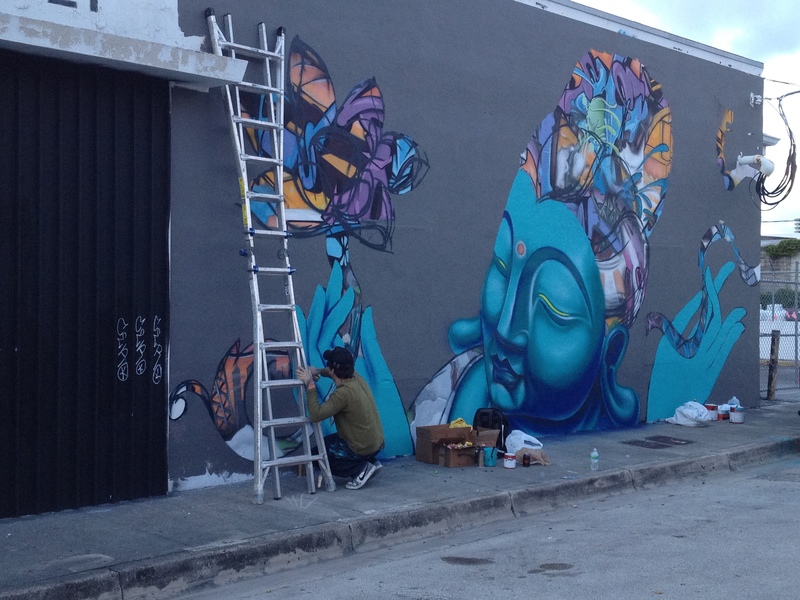 The moment you arrive in Miami you cant help but see the crews of painters setting up at every blank wall and turning it into a phenomenal piece of street art- particularly in the Wynwood District. Each year Art Basel heralds artists from all over the world and buildings become their canvas. International artists are collaborating and making great connections everywhere you look. Signs hang in windows saying, “Compassionate muralists apply within.” Each morning you open your eyes to a new facade and chances are- the artist traveled a long way to show up and share their talent- and unlike the rest of pieces at Art Basel- this work is not for sale but only to be enjoyed for the moment and was likely created over night. Parties erupt each night and artists get excited and inspired to create more imagery to share. They build a great community and help one another out- lending scissor lifts, ladders, and paint. Its one of the few true times that street artists can come out of their sheathe of darkness and paint openly on public walls. Groups of viewers grow each night going piece to piece and dancing in the streets. They become the backdrop for this explosive art scene that encompasses Miami for the week of Basel. The art doesn’t stop there though ladies and gentleman! Even I got to become participatory interactive art through Kikimora Studios (http://kikimorastudio.com/) where I performed at the Eco Art Fashion Week :Table for Two show as well as at Nikki Beach in her creations. 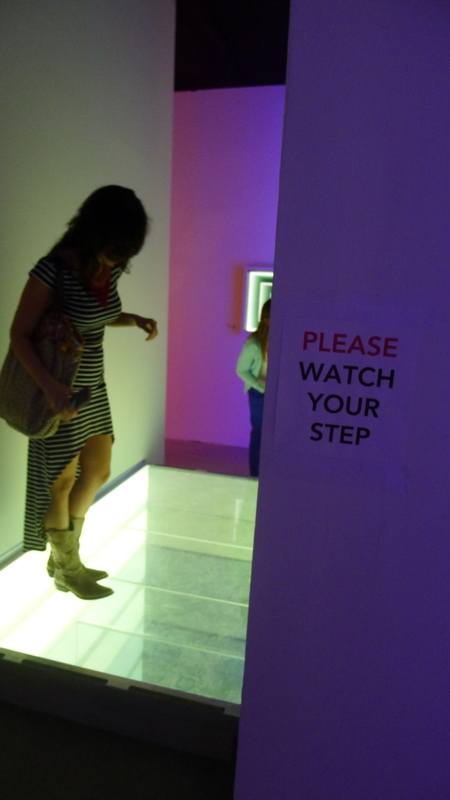 Did you see any fun participatory art at Art Basel Miami that I didn’t cover here? Feel free to post links in the comment section!